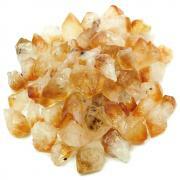 Tumbled Fall Equinox Mix — This Tumbled Fall Equinox Mix represents "Celebration and Release". 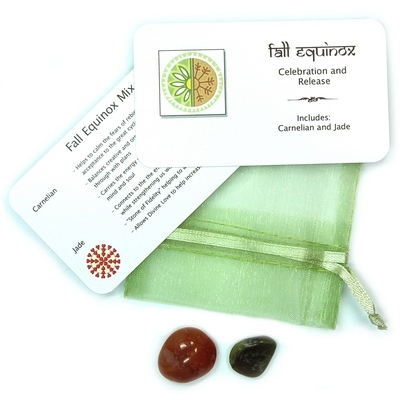 Each mix includes 1 medium/large tumbled Carnelian and 1 small/medium tumbled Jade "extra" in a lime green organza pouch with a beautifully designed reference card which details the properties for each stone. 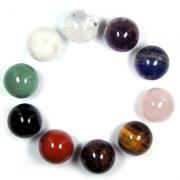 Carnelian calms the fears of rebirth. It brings serenity and acceptance of the great cycle of life. 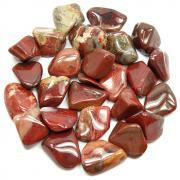 Carnelian also balances creative and organizational abilities needed to follow through with plans and carries the energy of the sun within it to energize the body, mind and soul. Jade connects to the energy of the earth, anchoring its energy while strengthening us within. 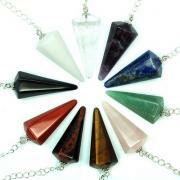 It is known as a "Stone of Fidelity" helping to align female and male energies and allows Divine Love to help increase one's enjoyment of like. Affirmation: My relationships are filled with harmony and good fortune. Question: What makes you feel fortunate?